Wolf Commercial Real Estate, a leading King of Prussia commercial real estate brokerage firm that specializes in King of Prussia commercial real estate listings and services, is now offering King of Prussia office space for lease in the Ross Corporate Center at 100 Ross Road King of Prussia PA. This King of Prussia office building for lease currently has seven suites ranging in size from approximately 1,115 square feet to 9,967 square feet (divisible) of prime King of Prussia professional office space for lease. This professional office space for lease in King of Prussia is ideal for a wide variety of professional and medical users. 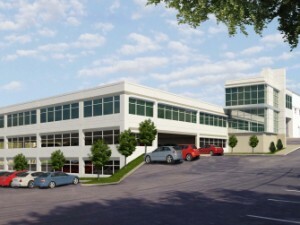 Suite 100 provides 1,115 square feet of professional office space in King of Prussia. Suite 202 offers 1,617 square feet of King of Prussia office space for lease. Suite 208 has 1,661 square feet of professional office space for lease in King of Prussia. Suite 170 features 2,378 square feet of King of Prussia professional office space for lease. Suite 150 provides 4,936 square feet of King of Prussia office space for lease. Suite 201 offers 5,475 square feet of professional office space for lease in King of Prussia. Suite 206 has 9,967 square feet of King of Prussia professional office space for lease. This King of Prussia office building for lease features aggressive gross structured rental rates. The asking lease price of this professional office space in King of Prussia in the Ross Corporate Center is $14.50-$16.00/sf gross. The King of Prussia office space for lease at 100 Ross Road King of Prussia PA is available for immediate occupancy through Wolf Commercial Real Estate, a premier King of Prussia commercial real estate broker with expertise in King of Prussia commercial real estate listings and services. This King of Prussia professional office building for lease has on-site ownership and management. The grounds, parking areas and building at this professional office space in King of Prussia are well-maintained. There is abundant parking and tenant signage available at this King of Prussia professional office space for lease. The Pennsylvania Turnpike (I-276) and the Schuylkill Expressway (I-76) are within close proximity to this King of Prussia office building for lease through Wolf Commercial Real Estate, a King of Prussia commercial real estate brokerage firm that specializes in King of Prussia commercial real estate listings and services. The location of this professional office space for lease in King of Prussia provides direct connections to Routes 202, 422 and 1-476, as well as convenient access to major metropolitan areas and suburban communities. There are numerous amenities near this King of Prussia professional office building for lease, including the King of Prussia Mall, hotels, and conference facilities. For more information about this King of Prussia office space for lease in the Ross Corporate Center at 100 Ross Road King of Prussia PA, or about any other King of Prussia commercial properties for sale or lease, please contact Drew Maristch (215-605-8018; drew.maristch@wolfcre.com), Anthony Mannino (215-470-6084; anthony.mannino@wolfcre.com) or Jason Wolf (215-588-8800; jason.wolf@wolfcre.com) at Wolf Commercial Real Estate, a King of Prussia commercial real estate broker. Wolf Commercial Real Estate is a leading King of Prussia commercial real estate broker that provides a full range of King of Prussia commercial real estate listings and services, marketing commercial offices, medical properties, industrial properties, land properties, retail buildings and other King of Prussia commercial properties for buyers, tenants, investors and sellers. Please visit our websites for a full listing of King of Prussia commercial properties for lease or sale through our King of Prussia commercial real estate brokerage firm.